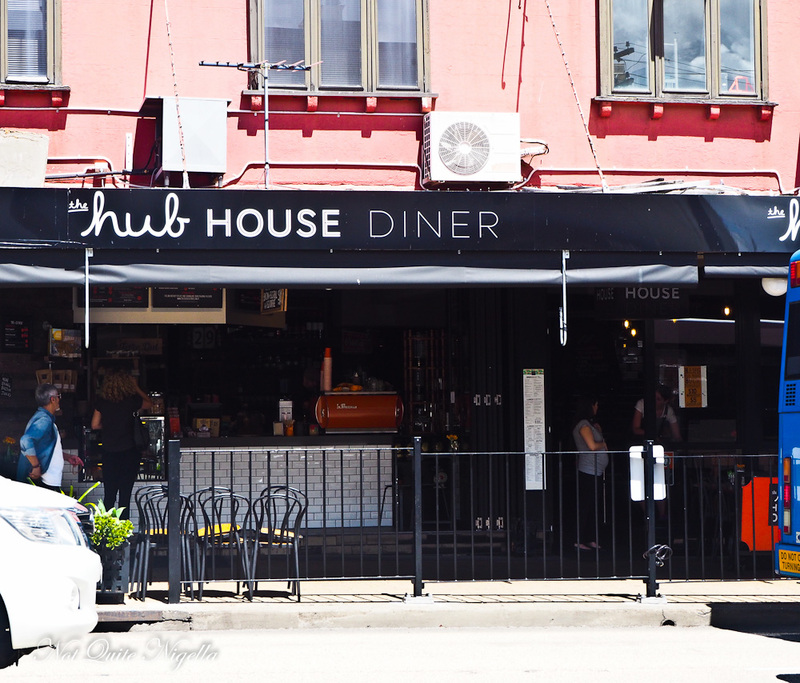 Hub House Diner on New Canterbury Road in Dulwich Hill serves up hearty servings of burgers, sandwiches and salads as well as sweet treats like Nutella slathered cronuts and sundaes. 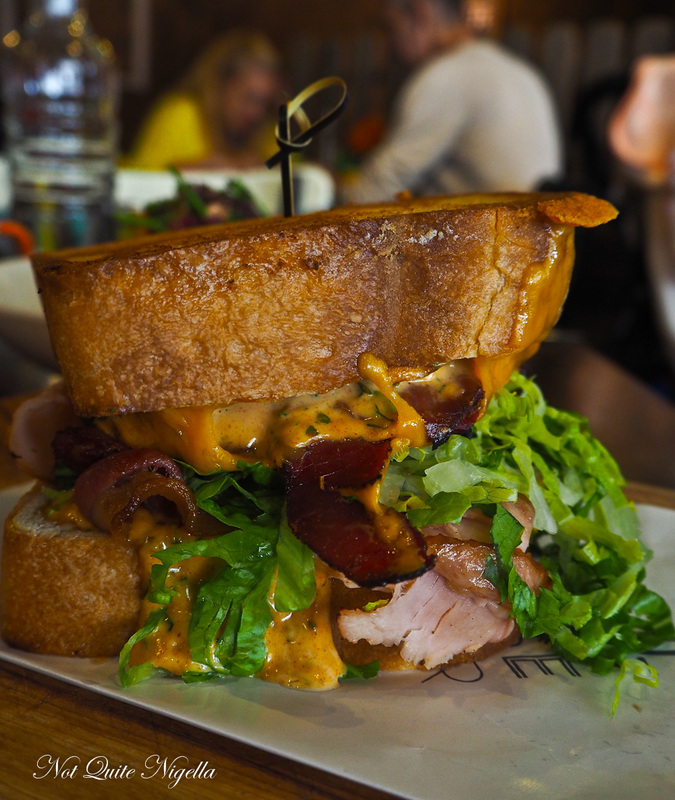 And that's not mentioning the impressive and delicious Texas Toast! It's a popular spot at lunch time on both weekdays and weekends and is open for breakfast, lunch and dinner. So the rule is that apparently you need to eat within two hours before training. I have been told that by countless people. The only thing about that is that if I do that, I feel like throwing up. So when Belinda asked me what time I wanted to meet at Hub House Diner I considered my 4pm training session with Nina my sadistic trainer. Counting back I figured that eating at noon would give me a good four hours to digest the food. It may have something to do with the size of my meals and how I resemble a snake that has swallowed a wombat. 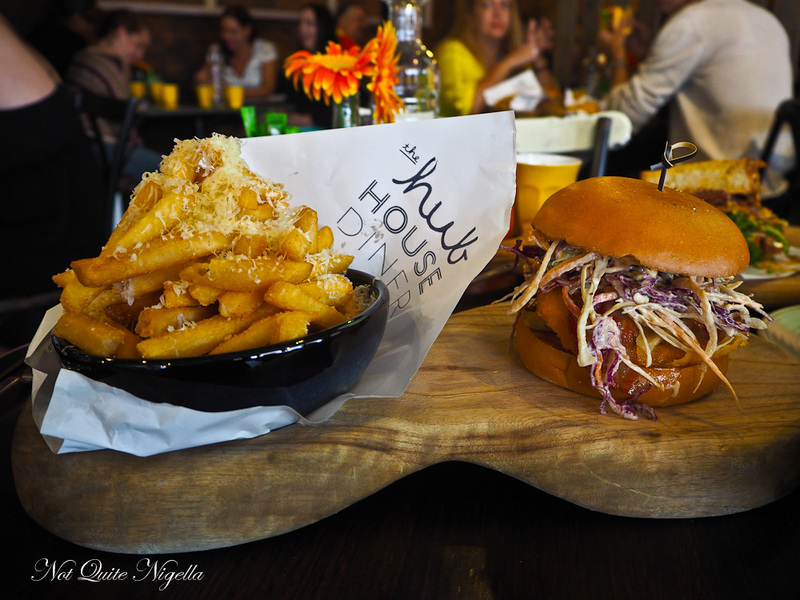 It doesn't help or hurt that the menu at Hub House sounds excellent and Belinda is somewhat of a regular there so she has tried a few things that she strongly recommends. It had taken me a while to visit. 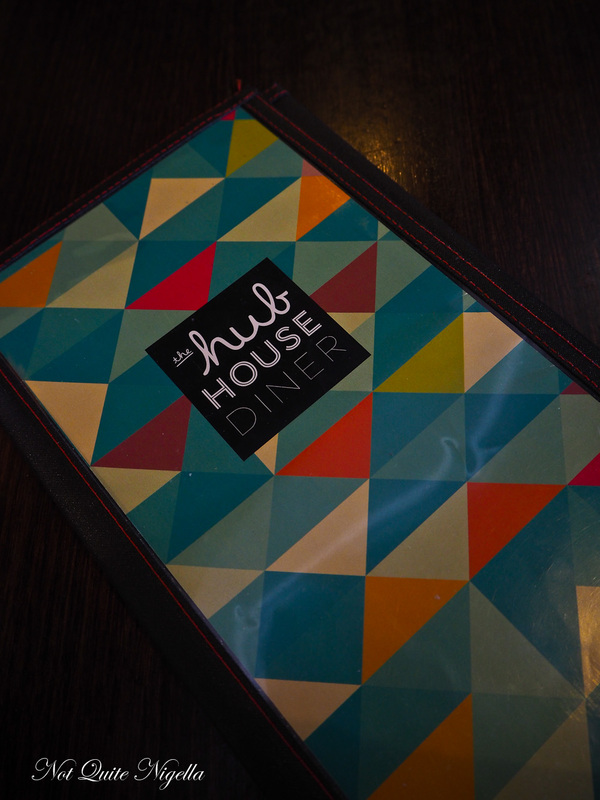 When Hub House Diner first opened, a good friend whose taste that I trusted visited there. Nonplussed they warned me off the place but over time they had changed the chef who is now Joseph Sergio and the food has from all reports by friends improved markedly. The atmosphere is welcoming and the service is friendly and accommodating from all staff members. 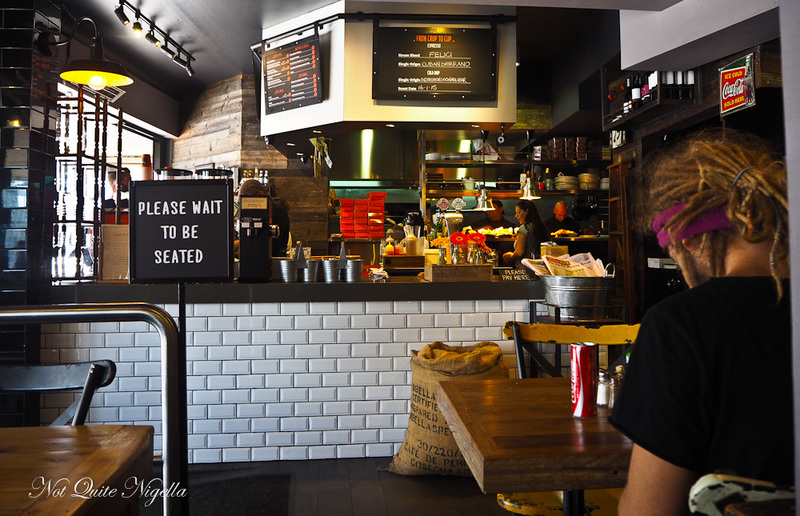 It does a busy takeaway business and customers can order online. Belinda recalls the chicken burger being more like a Southern fried chicken fillet. This is a breaded chicken fillet with double smoked bacon, Gruyère, coleslaw, gherkin, onion and smokey chipotle aioli. I like the idea of a crunchier, more battered chicken fillet although this is good. I prefer this with a slathering of the hot sauce aioli on top. But as for me, I'm utterly smitten by the pimped up fries. These are golden crunchy and smothered in finely grated truffle manchego cheese. If you can resist these you are much stronger than I as I ate half of the bowl. Trainer? What trainer? Oh the salad. Hello salad. I didn't see you there in the corner. Like a middle child this was somewhat ignored in lieu of the other items that we tried first as we wanted to eat them while they were hot. 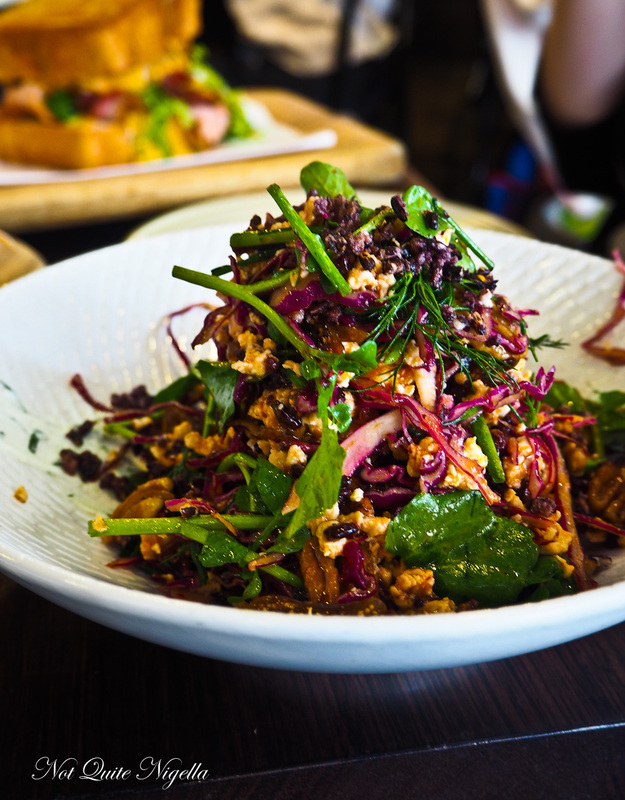 It's a sweet salad with black rice, chicken mince, chopped pecans, dried figs, watercress, cabbage, infused orange oil and labne. It's a good salad but there is something almost willfully foolish about ordering this when you have Texas Toast and a fried chicken burger. There's a little break and come 2pm all but a couple of tables clear out. This gives us a bit of time for our meal to settle before the lure of dessert beckons. There's a range of cakes in the window but our waitress mentions the word Cronut and we're curious to try their version (made for them by a patissier). It's a great specimen of the cronut, light and crispy and not at all oily or greasy despite its origins. It is rolled in cinnamon sugar and covered with Nutella on top. It's not quite what I expect, not in a bad way but the maple sweet ice cream is more maple than peanut. 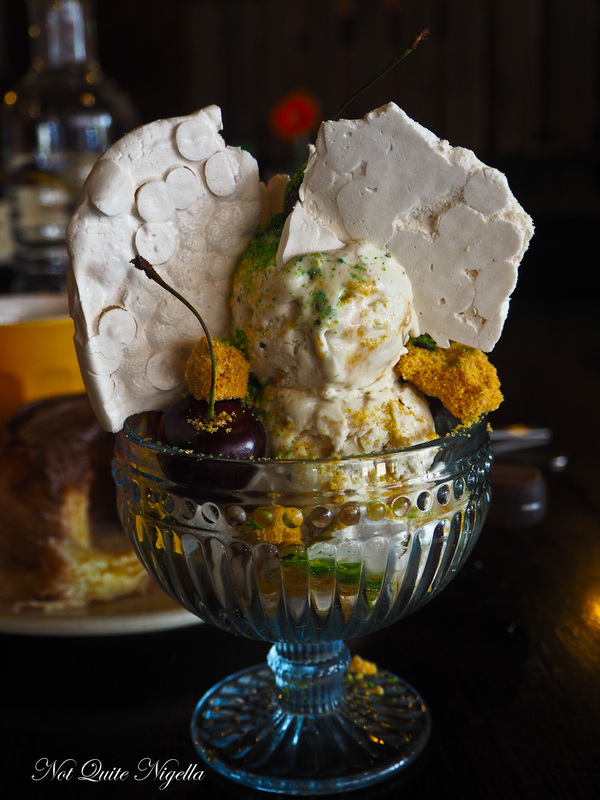 It comes with meringue, cherries, jubes, whipped cream and cubes of peanut honeycomb powder. Try as we might, we can't make a dent into it and I get the distinct feeling that Nina won't be too impressed if I do! So tell me Dear Reader, can you eat within two hours of working out? 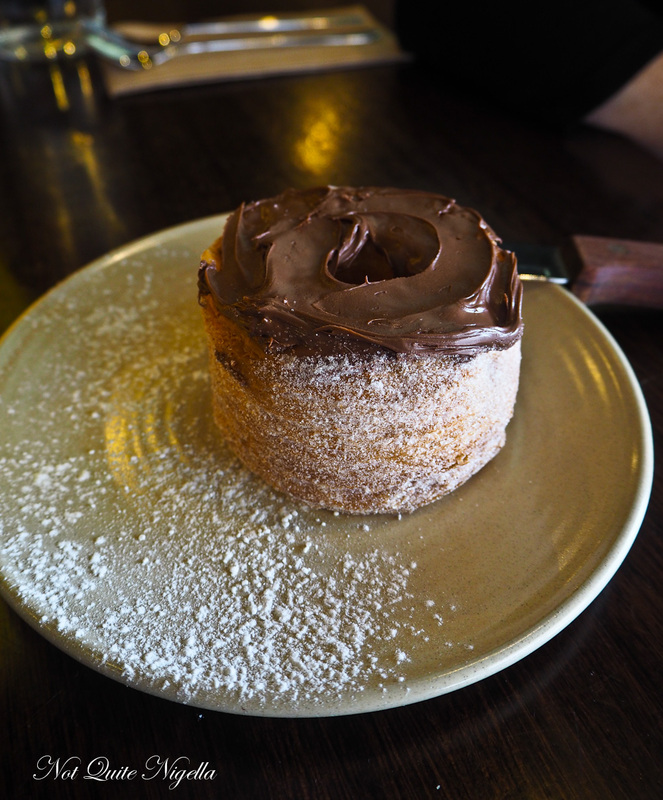 And I know they've been out for a while but have you tried a Cronut yet? What do you think of them and other hybrid foods?